Tomas Vu-Daniel received a BFA from the University of Texas, El Paso, and went on to earn an MFA from Yale University. He has been a professor at Columbia University School of the Arts since 1996, when he helped found the LeRoy Neiman Center for Print Studies where he continues to serve as Director/Artistic Director. In 2000, he was appointed the LeRoy Neiman Professor of Visual Arts. Vu-Daniel has exhibited nationally and internationally and has had solo museum shows in Japan, Italy, China, and Vietnam. He currently lives and works in New York City. 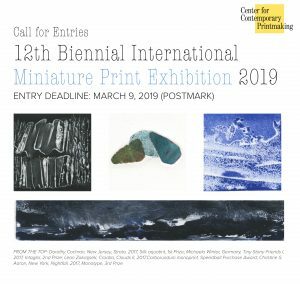 Eligibility: All fine art printmaking mediums, including woodcut, intaglio, lithography, silkscreen, monotype, and original digital media (No drawings, photographs, or direct reproductions are eligible.) Prints may not exceed a total image area of 4 square inches (25.8 square cm), e.g. 1 x 4 in., 2 x 2 in., 1-1/2 x 2-2/3 in., etc. Outside dimensions of the printing paper may not exceed 8 x 10 in. (20.3 x 25.4cm). Paper beyond these dimensions on accepted prints will be trimmed to the dimensions required for the exhibition. Only two-dimensional works will be accepted. Entry Fee: Each artist may submit up to three prints, for a fee of $30 for CCP members, $40 for non-members, and $50 for international entries. (International entry fee includes return postage). Two additional entries will be accepted for an additional fee of $10 each. The fee must accompany the entry form and must be in U.S. dollars only, in the form of a check or money order, made payable to Center for Contemporary Printmaking. (Any currency other than U.S. dollars will not be accepted.) Do not send cash. Entry fees may also be paid through PayPal: send to jakers@contemprints.org. Prints donated in lieu of payment of the entry fee will not be accepted. Entries not accompanied by fees become the property of CCP. Prizes and Awards: Cash prizes will be chosen by the juror, and purchase prizes awarded.